Speaking Your Rocker’s Language: What is “Dissonance”? Summerfest in Milwaukee, WI is the world’s largest music festival. 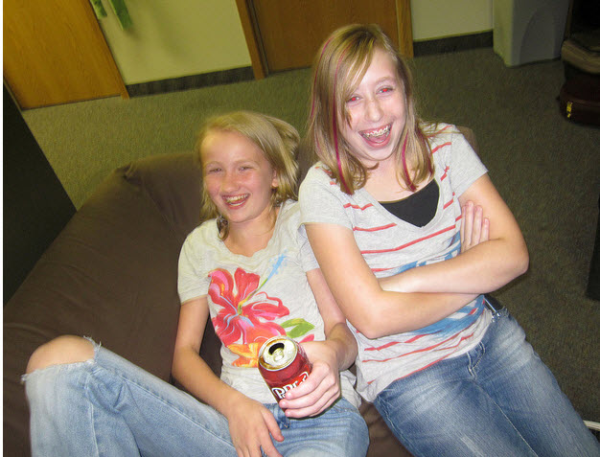 So when our National Office told us they had secured slots for students from School of Rock St. Paul and School of Rock Eden Prairie to perform….well you can imagine how stoked we all were. The requirements were quite stringent to participate. Four professional musicians served as judges while teens from 13-18 auditioned to participate. 17 students from around the Twin Cities passed muster and the rehearsal process began. From March – May the teens practiced their songs on their own and in May and June they came together weekly to rehearse. They weren’t rehearsing just to play Summerfest. They were also going on tour. 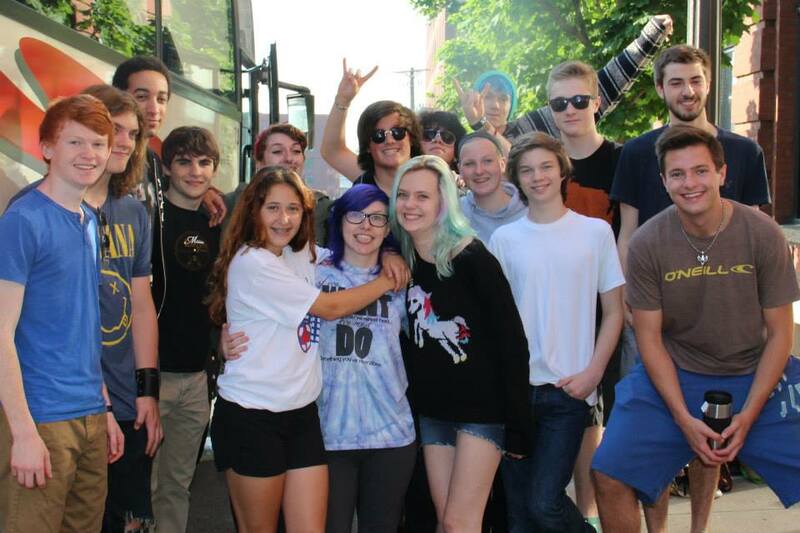 School of Rock St. Paul and School of Rock Eden Prairie students go on 5-City Tour. 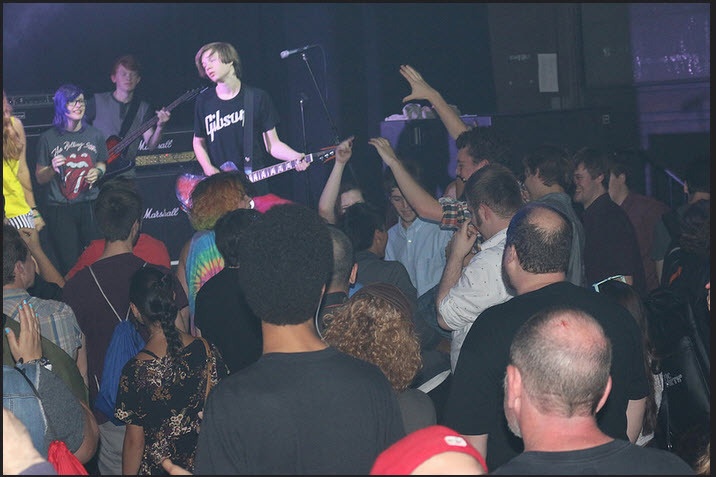 On June 23, 2014 at 8:00am the tour bus pulled up in front of School of Rock St. Paul where sleepy-eyed teens loaded their instruments and suitcases in the storage area and climbed aboard their first-ever tour bus. I figured they’d be so excited that they’d be full of energy. Nope. You’d think it was their 1,000th tour or something. Just your average, every-day, non-emotive teens. We were on our way to Omaha NE where we were scheduled to play The Waiting Room that night. Kids woke up in about Des Moines, IA and the energy began to rise. The small talk became a dull roar by the time we pulled into Omaha. Barely time to stop at the hotel to drop off suitcases before getting to the venue. Back on the bus…quick stop by the venue for pizza and onto our first road gig. The crowd was receptive as School of Rock St. Paul and Eden Prairie joined School of Rock Omaha at one of Omaha’s best live music venues to perform an all-ages rock concert. While hopping on the bus to head to the hotel, the musicians met a man taking a snake– a BIG snake– for a walk. 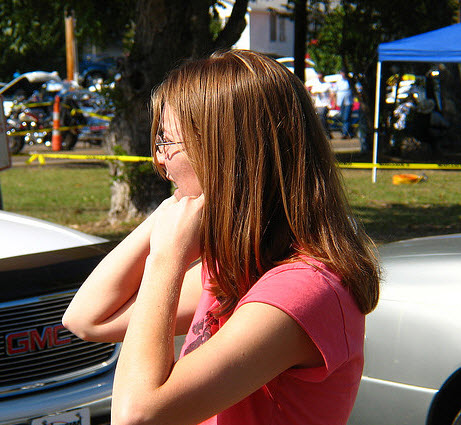 Most of the rockers were curious while others kept their distance. The man gave us all a sidewalk lesson in caring for snakes and off to the hotel we went. An hour at the hotel pool to come down from the performance high; then it was lights-out for our early wake up call and the short trip to Kansas City, Missouri. 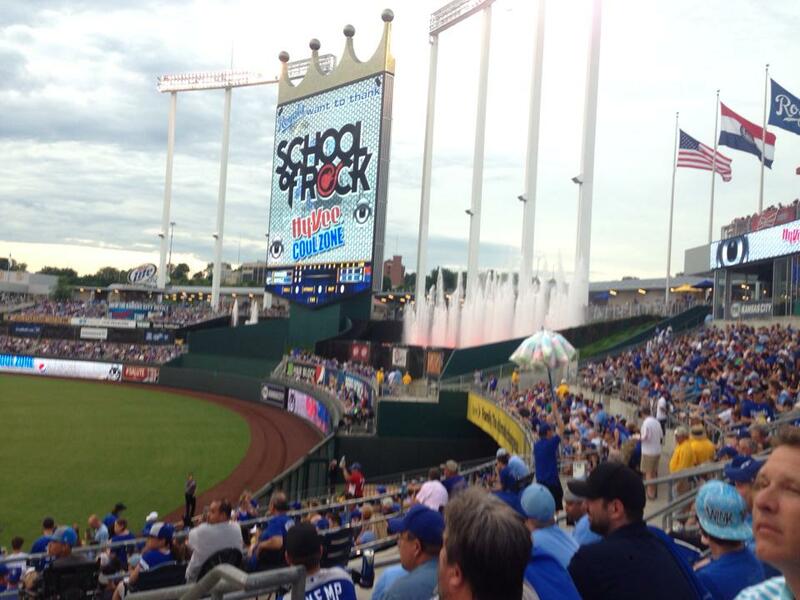 School of Rock Twin Cities Performs at Kauffman Stadium prior to Kansas City Royals Game. We had an early gig in KCMO as we were booked to play at Kauffman Stadium for the guests coming into the Royals vs.Dodgers game. Since we arrived in town early, we hit Dave and Busters for an early lunch and friendly video-game challenges. Then to the hotel for a quick nap, shower and off to one of the most beautiful MLB stadiums in the nation to play an outdoor concert. The Royals graciously treated to us to tickets to the game after we played. With the Royals trailing in the 7th, we left for bad tacos at a local MO fast food chain and a short trip to the hotel. Tomorrow was another day and another gig. June 25, 2014 – Destination: St. Louis MO. We stopped by one of the two School of Rock locations in St. Louis. The newest School in a quaint town called Kirkwood. Cool School and a cool staff. As we’re getting the tour, Adam, our Tour Music Director looks into a room where a teacher is give a guitar lesson. The guitar teacher looks up, jumps up and comes out and hugs Adam. They were students together at McNally Smith College of Music. Both are now teachers at School of Rock in different states. How cool is that?! You might think after all this music playing, the touring students might want to do something other than play music. Right? Wrong. 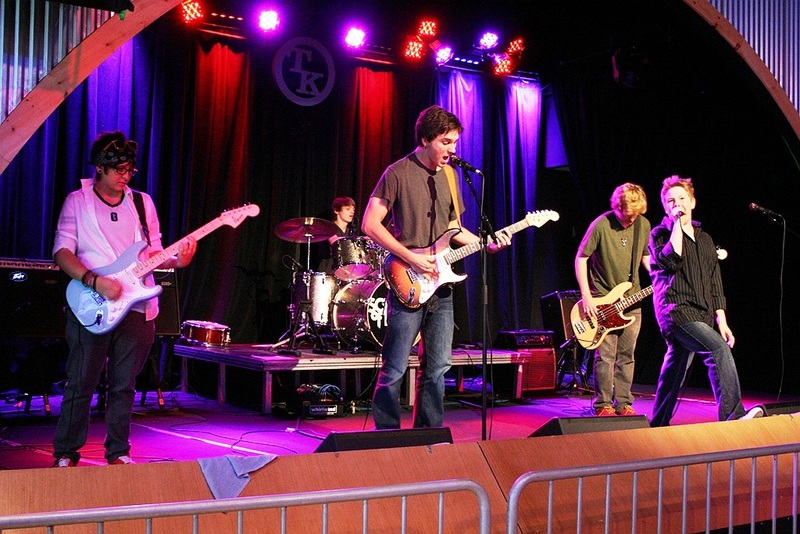 The School of Rock Kirkwood warmly welcomed the Twin Cities rockers and the jams began until we pulled them out to head over the venue for load in and sound check. Kirkwood Brewing Station was the venue de jeur. While the performance was arguably the best of our Heartland Tour, the venue was not prepared for the fans we drew. They did their best, but could have had at least two more servers for the crowd. If you ever find yourself in Kirkwood, I highly recommend the Brewing Station and specifically their INSIDE OUT GUACAMOLE. Great shows and packed venues are hard to come down from, so this was a later night than usual. Pool time followed by pizza party at the hotel and a walk over to DQ was just the trick. Lights out for tomorrow’s trip to Chicago. It’s only 5 hours from St. Louis to Chicago so we left in what we thought was plenty of time. Sadly road construction and rush hour traffic slows us up and the most quintessential rock-n-roll event of the entire trip happened at Lincoln Hall in Chicago. Our bus pulled up in front of the venue. The rockers stepped off the bus and literally stepped right onto the stage to perform their set. No sound check, no warm up, no wardrobe change, no make up and no teeth brushing. Now THAT’S rock-n-roll. And everyone in the crowd knew it. They showed their appreciation with hoots and hollers and raucous applause. We’ve now performed four shows in four days and traveled over 1,100 miles. The School of Rock Eden Prairie and St. Paul students are pros. Everyone continues to bring their “A-Game” and they are becoming known as the band of teens with incredible stage presence. Tomorrow we’re on our way to Milwaukee for what is anticipated to be the highlight of the tour. For tonight, we’ll do what we’ve done every night up til now; hit the swimming pool at the hotel for a little fun and then turn in for the night. We arrive in Milwaukee early Friday afternoon and find our way to Marquette University dorms. This will be home for the weekend for us and 50 other School of Rock franchises from around the world! We get our room keys and head up to our floor. (Observation from a chaperone: Dorms have come a long way in the past 35 years!) Students are assigned 2 or 3 to a room where they drop off their belongings and we meet back in the common area on the floor. Tonight’s gig is at the Horny Goat. School of Rock has erected a huge tent behind the bar and set up a professional stage and sound rig at one end and sand volleyball courts at the other end. In the middle, everyone mingled and rocked out to the live music performed by all the Schools of Rock. Many of the schools coming in didn’t know other students. For us it was fun to catch up with the kids we met in Omaha and St. Louis earlier in the week. The energy in the air at Horny Goat was palpable. For many this was the kickoff to an unimaginable weekend. For us, it was the transition from one experience-of-a-lifetime to another. Though the party went well past midnight, the Twin Cities students were ready to head back to the dorms around 10:00pm. Remember, we’ve been on the road 5 days now while many of the rockers just arrived today. 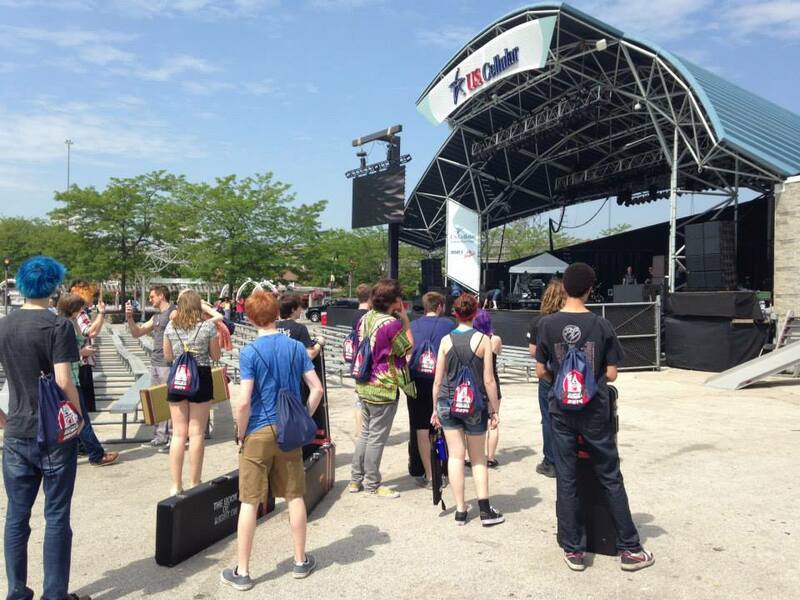 All day Saturday and all day Sunday, School of Rock bands from around the world, including ours here in the Twin Cities, performed on the main stages at Summerfest. The same stages performed by Arctic Monkeys, Five Finger Death Punch, Neon Trees, Umphry’s McGee, The Hold Steady, Brother Ali, Joan Jett, Ludacris, Atmosphere, REO Speedwagon, Cheap Trick, .38 Special and more. The stages many, many musicians of all ages only dream of playing. 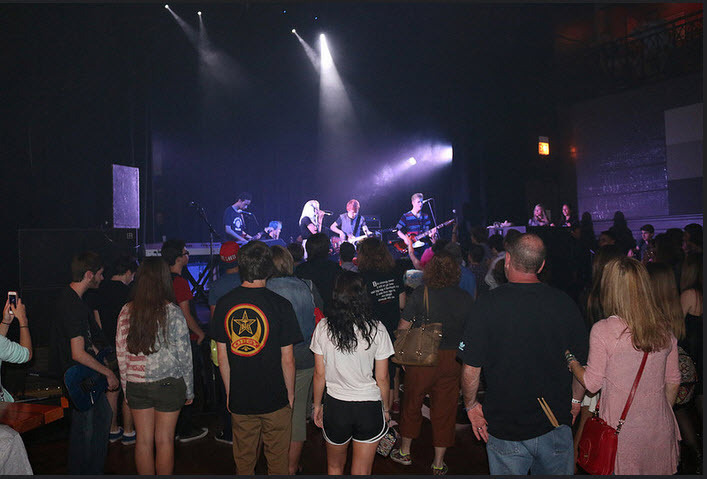 It was a dream come true for 17 teen musicians from the Twin Cities and a dream only students at School of Rock have the chance to experience. Are you thinking about buying a first guitar for your child for Christmas, Hanukkah or a December birthday? If you’ve never bought a guitar before you may be a bit overwhelmed by all the choices, the options and the price points. Before you go shopping for your child’s first guitar, here’s some advice from a musician’s mom on what to look for. Most guitarists have a brand preference and the two most popular brands are Fender and Gibson. If your son or daughter has been researching guitars they are most likely looking at the Fender Strat or the Gibson Les Paul. Both are fabulous guitars but you don’t need to spend that much money to get started. I would, however, encourage you to buy a brand carried in authentic music stores like Guitar Center. I’d suggest you plan to spend $400-$500 when buying first guitar. You can certainly get them cheaper but cheaper guitars tend to fall out tune more frequently and they just don’t give you a true sound. If I were buying a first guitar for someone today I personally would select between Epiphone Les Paul 100, Fender Standard Telecaster Ash or the Gibson Melody Maker. Price and brand seem to be the most obvious considerations but here are a couple other features to factor in your selection. Guitars come in many shapes and a lot of kids think the odd shaped guitars are cool. The challenge with the odd shapes is that it is difficult to rest the guitar on your leg while you’re sitting down so you have to always stand up to play. The thickness of the neck of the guitar is also important. Every guitar is different so be sure your rocker can reach around the neck to easily finger EVERY string. Now you have the guitar figured out, there’s one more item that you really want to complete the fun; a few lessons to get your rocker started. Imagine the excitement of getting a first guitar and having no clue what to do with it. Mom starts calling around for lessons only to find most teachers are on vacation the week between Christmas and New Year. And the guitar sits in the corner. Not exactly the memory you intended to create. If you have a guitar-playing friend or family member who will be at your home during the holidays they’ll be able to provide enough direction to get your young rocker going. But if you don’t know anyone who can show your child how to hold the guitar, tune it, strum the strings or play a chord, then do you really think s/he will even pick up the guitar for the rest of the holiday? 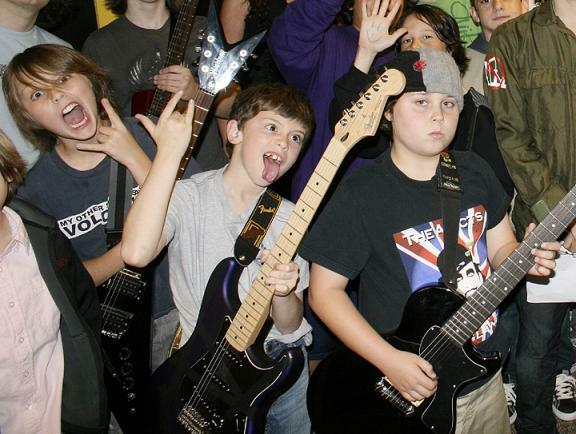 That’s why the School of Rock is offering the Beginner Guitar Camp. It’s 12noon – 3pm for three days; December 26, 27 and 28. (We know you don’t want your child to spend the entire week away from the family, at a guitar camp.) Your new rocker will learn the basics so they can enjoy their gift and still have time to enjoy other aspects of their break from school. And the best part about Beginner Guitar Winter Camp – it’s ONLY $99. That’s nine hours of instruction for just $99. Ages 7 – 16 welcome. Call your nearest Twin Cities School of Rock to claim a spot for your son or daughter. Writing a good song can be a daunting task especially when inspiration doesn’t come naturally. So we asked School of Rock Original Songwriting program instructor and St. Paul School of Rock Music Director, Adam Durand for tips on writing a good song. “The biggest piece of advice I can give is, start with one solid idea and focus on the core of what you’re trying to say,” recommends Adam. With that in mind, follow these tips on writing a good song. 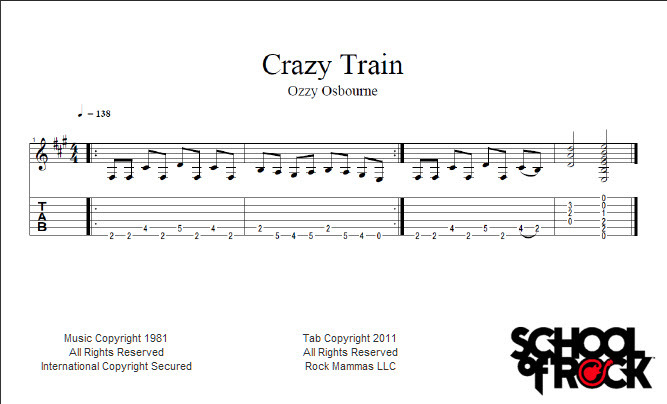 Listeners like this song form because it provides enough repetition to feel familiar and keep them interested. Songwriting is easier for those who play an instrument. However, if you do play an instrument, put it down and spend some time singing melodies and sounds. When writing song lyrics imagine you are talking to somebody you want to impress or someone you feel a deep emotion for. The more connected you feel, the more your audience will be engaged with you and your story. Choose a genre and get familiar with it. Spend time listening to classic rock music. Listen to the top 20 all time hits and study the chords, melodies, and lyrics and see what they have in common. Dissect your favorite songs from the group to truly understand the parts and how, together, they build the song. The more you know how chords and melody interact, the better. In the Queen song “We Will Rock You” the title is the hook. The Beatles “Let It Be.” Just reading those three little words sparked the song to play in your mind, didn’t it? That’s the power of the hook! The last thing to do is write the song title. Writing a good title is very important because it’s the symbol for the tune. It’s what people identify with and it’s what the buyer will ask for in the record store or search for on i-Tunes. This is why so many great songs use the hook for the song title. 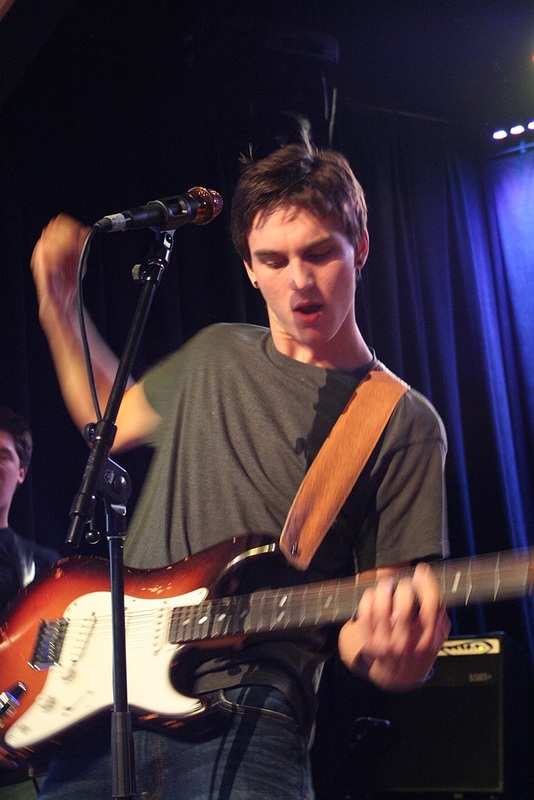 If you’re a teen rock musician who wants to learn to write your own music, check out the School of Rock’s Original Music Program, available in St. Paul, Burnsville and Eden Prairie, Minnesota. Not only will you learn to write and perform your own music, you’ll also learn to market your band, bringing a crowd to watch you perform at a local rock venue. This program is the stepping stone between student and professional musician. When your child expresses an interest in playing a musical instrument, consider the world’s most popular instrument; the guitar. Just as the guitar is a great first instrument, a guitar lessons day camp in Minneapolis is a great introduction to learning to play. As you’ve likely experienced, it’s easier to learn things when you’re younger so start your child early on the guitar and he’s likely to stick with it the rest of his life. The guitar is an easy instrument to learn (though challenging to master). When your rocker learns the basics of playing the guitar, she’ll be able to play songs that people recognize. That’s very rewarding for kids in our “instant-gratification” society. It also motivates young musicians to keep playing. 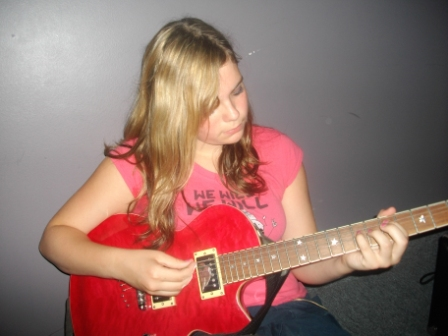 A guitar lessons day camp in Minneapolis will teach your child the basics of playing songs he – and you – will recognize, thus minimizing frustration and creating a lifelong love of music. The guitar is a great investment if you want your child to learn to play a musical instrument. And you can enhance the value by enrolling your kid in a guitar music day camp in Minneapolis. When your child is taught how to play the guitar, he’ll enjoy it and keep playing. If you expect your child learn to play the guitar on his own, you’ll likely find your investment gathering dust in the corner of your child’s bedroom. The camp you select should have a great blend of fun and education so that your rocker comes out playing his guitar and saying he had a great time. Here’s such a camp. While most people love listening to music, not everyone can play a musical instrument. Those who can play one—especially the guitar, which is thought of as hip and cool—are often envied by those who can’t. One of those “music words” you may not understand is dissonance. What is dissonance? When we listen to music, certain notes sound pleasing when played together. Dissonance is when we create a sound that is not harmonious. There are degrees to how harsh the dissonance can be. If you were to play a C (5th fret, G string) and a C# (2nd fret, B string) together, it would sound as if the notes are clashing. In a sense, they are – you feel that this combination of notes wants to turn into something else. It’s almost as if you’ve caught them in mid-metamorphosis. Play these notes again and now slide your finger on the C down to B (4th fret, G string) and at the same time slide the C# up to D (3rd fret, B string). Can you hear how the dissonance completely disappears? It’s the interplay between dissonance and harmony that helps to add a dramatic, almost dynamic aspect to a song. But the thing to remember is that not everyone hears the same sorts of dissonance. It’s a matter of what you’re used to.” Read more about dissonance at Guitar Noise. Whether it’s a kid asking to play a musical instrument or a parent thinking their child needs to learn to play an instrument, most kids will take music lessons at some point in their youth. More often than not though, it’s the parents who make the call on what instrument their kid should play. There are perceptions of which instruments reflect the family’s core values. For example, the violin suggests an appreciation for classical music while the guitar may suggest a more middle class family. Or maybe the decision is guided by whatever is taught at school. But there’s more that should be taken into consideration when selecting the musical instrument your child will study. When a child learns how to play an instrument it will have a life-long impact. What is that impact? Screenwriter John August has strong opinions that make a lot of sense; and made me think about music lessons in a way I hadn’t before. Sure: the violin’s great, and plays an important role in Western music. But should it be a kid’s first instrument? We’ve all seen those little kids with their Suzuki lessons, but I want to see the follow-up: How many of those kids grow up to play violin, or any musical instrument at all as adults? A kid who learns to play piano or guitar proficiently will be able to play socially for her entire life. Moreover, the piano/guitar kid will have a better sense of chords and polyphonic structure than the kid who only plays violin. According to August, parents should lead their kids to pick the musical instruments that are the easiest to learn, like the ever-popular guitar and piano. August believes these instruments are very easy to learn (note though, that learning to play these instruments is different from mastering these instruments), so the kids are likely to be motivated and continue playing with them for a long time. He observes a lot of kids quit playing the violin when they grow up, making those lessons much less valuable. 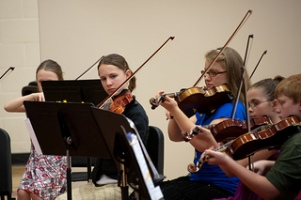 While the violin is a beautiful instrument, violin lessons for kids are completely another matter. John August means well, but no two kids are completely the same. Violin lessons for kids may work for one kid but not for another, and vice-versa. August raises some quite valid points, though. It’s tough to get a kid interested in something for a long time, and musical instruments are no exception. I think it’s ideal for parents to hear their kids out before picking a musical instrument for them to learn. It’s the child who’ll be doing the playing, anyway, so their vote definitely counts. John August gives parents plenty to consider; you can read it all by clicking here. Join us at School of Rock, where we play Ozzy, Black Sabbath and all the classic rock bands.